Did you know that the 50th Earth Day Celebration is coming in 2020? The perfect time to start planning is this year’s Earth Day. We will be gathering on Saturday, April 20th from 1 p.m. – 4:00 p.m. at the corner of Craven and S. Front Streets in the vacant lot next to Mitchell Hardware. 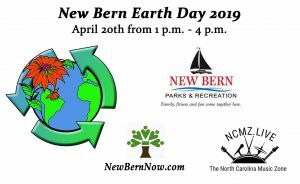 We’re happy to announce that we’ve teamed up with City of New Bern Parks and Recreation and ncmz.live to present New Bern Earth Day 2019! Our goal is to bring people together to meet like-minded citizens while exploring opportunities that we can all take to protect our local natural resources, environment, wildlife, waterways and ultimately counter climate change. We’ll have live music, preservation, environmental, and conservation exhibits, and eco-conscious children’s activities. We also need volunteers to help us on the day of to set up and clean up, directing attendees, participating in children’s activities, and help exhibitors. We are in the process of confirming volunteers, exhibitors, and sponsors. Deadline for exhibitors and sponsors is April 2. Please help us put on this great event by volunteering! Our next volunteer planning meeting is scheduled for Saturday, March 30 at 1 p.m. Location to be determined. Special thank you goes out to Artist Chris Wagner of The Sanctuary Gallery for creating the artwork for New Bern’s Earth Day logo! To be an educator, volunteer or sponsor, please send an email to info@newbernnow.com or text/call 252-259-6853.